This program allows the user to enter any positive integer. Next, it will divide the given number into individual digits, and finds the product of those individual digits using For Loop. 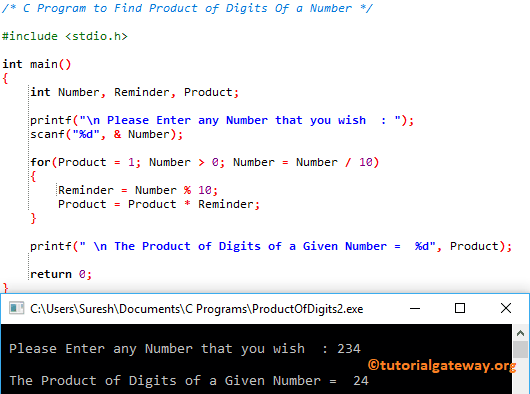 This C program to calculate product of digits in a number is same as above but, we just replaced the For loop with While Loop. This program is the same as the first example. But, we separated the code using Functions. Within this C Program to Find Product of Digits Of a Number, Inside the function, the Static variable will initialize the value only when the function called the first time.